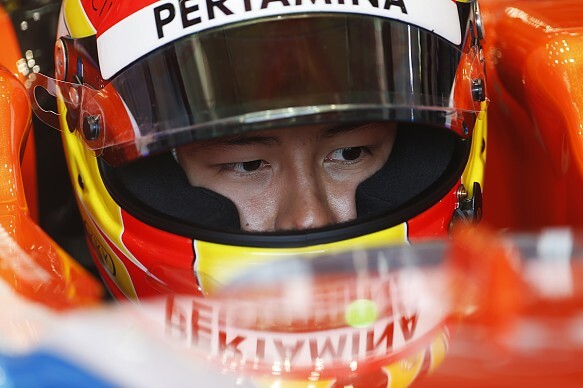 Rio Haryanto’s future with the Manor Formula 1 team is in doubt, but his management is “90 percent” certain a solution can be found with the Indonesian government. The rookie’s manager Piers Hunnisett said Haryanto’s seat was secure until F1’s summer break after the Hungarian Grand Prix, but acknowledged there had been complications with the promised funding. “At the beginning of the year the minister for sport promised us a certain amount,” Hunnisett said. “That has been slightly delayed, or wasn’t quite as it came across. He said he was trying not to let the uncertainty impact on his driving. Hunnisett said the level of enthusiasm in Indonesia for Haryanto’s exploits was such that he had to be confident more money would be forthcoming. “In Indonesia, it’s huge news,” he said. “The government, the ministers, the media people have fallen in love with Formula 1. There’s a huge following. Obviously Pertamina, the state oil company, have invested quite heavily in Rio. “I’ve just come back from Indonesia yesterday. The ministers and the government are all working very hard just to finalize the last bit of budget. I think the government were initially waiting for some other, maybe commercial, sponsorships to come through.